The ASEAN-Korea Center collaborated with several Korean institutions to host an entrepreneurship forum on Nov. 12. 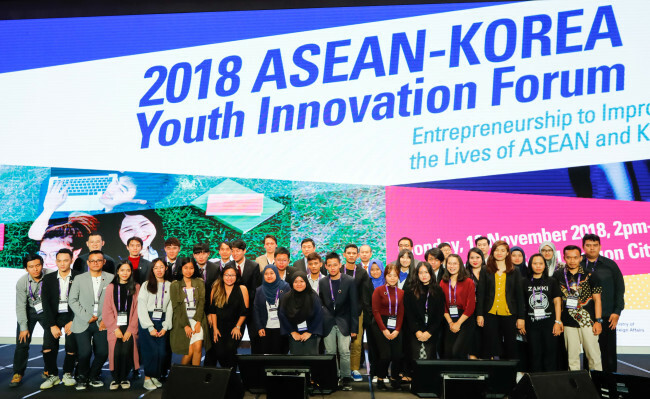 The event, titled ASEAN-Korea Youth Innovation Forum, brought together the creative business ideas of some 400 participants from Korea and the Association of Southeast Asian Nations. It was held at Yongsan Dragon City in Seoul and jointly organized with the Science and Technology Policy Institute, Seoul Metropolitan Government and Korea Entrepreneurship Foundation. Held in conjunction with Global Entrepreneurship Week Korea 2018, 11 startup entrepreneurs from the two regions who were finalists at this year’s ASEAN-Korea Startup Idea Competition introduced their ideas to a panel of experts. They also listened to other entrepreneurs’ success stories and discussed ideas together. The forum is geared toward inspiring new businesses through the discussion and exchange of insights, he added. Since 2014, the forum has served as the sole event here encouraging entrepreneurship among ASEAN and Korean students. Lee’s speech was followed by remarks from Seoul Mayor Park Won-soon, Science and Technology Policy Institute President Cho Hwang-hee and Korea Entrepreneurship Foundation Chairman Hwang Cheol-ju. The Young Innovators Talk featured presentations by entrepreneurs from the two regions. Innopresso CEO Cho Eun-hyung Jeff, the creator of Mokibo -- a touchpad-embedded keyboard -- revealed how his innovation minimizes daily inconveniences, while Quan Quan Nguyen from Vietnam, co-founder of Senior and Youth, presented his experience of establishing an online language-learning business. In the business plan pitch sessions with venture capitalists, 11 finalists from the 279 participants at this year’s ASEAN-Korea Startup Idea Competition expounded their plans. The finalists represented Brunei’s Attraversiamo.BN, an online company specializing in personalized travel planning in Southeast Asia; Cambodia’s Chhlat, offering drinking water solutions at schools; Indonesia’s Zakki, an online and mobile platform facilitating charitable donations to benefit the elderly and people with disabilities; and Indonesia’s Brainstat Group, a startup comprising academicians and professionals from the health, transportation and smart technology sectors. Other finalists were from Laos’ Korkkaek, which reuses scrap wood to produce sustainable products; Malaysia’s Enactus Universiti Utara Malaysia, a nonprofit that empowers disadvantaged communities with knowledge and skills; KembaliKash from Myanmar, Singapore and the Philippines, which helps Indonesian migrant workers in Singapore gain better control of remittances sent back home; the Philippines’ Phinix, a textile recycling center that produces footwear, bags and fabrics; Thailand’s Better Life Company, which aims to improve people’s lives with an application that provides solutions to daily problems; Vietnam’s Profill, which helps create resumes and detailed career road maps; and Korea’s Coeco, a firm that aims to improve urban hygiene by recycling local waste products. The finalists were awarded prize money in various amounts, and on Nov. 13 they took part in a mentoring session and received expert feedback to help them materialize their plans.